Liquid Extinguishant Fire Extinguisher has been developed in public fire safety interest for common persons to any user’s personal, house-hold, office as well as house-lady’s kitchen fire safety with a functional fire extinguishment time of 8-10s on 100 cm2 Size Class A & B Fires and 25-30s on 1000 cm2 Fire. This would cost only Rs. 100/- to 200/- for a half litre to one-Litre plastic spray-bottle versions. This fire extinguisher is capable of extinguishing Class A fires involving ordinary combustible materials like paper, wood, grass, leather, plastic goods etc as well as Class B fires involving Flammable liquids such as petrol, diesel, kerosene, lubricating oils, etc. with better fire efficiency. 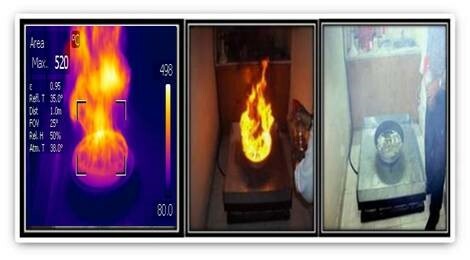 It works on the principles/methodologies of: oxygen depletion, flame chain-reaction inhibition and flame-zone cooling by lowering flame temperature. Fire Suppression Time: 8-10s on 100 cm2 Size Class A & B Fires and 25-30s on 1000 cm2 Fire. Extinguishant App. Rate: 1-5 g/s for different Classes of fires. Product has an affordable price.